Barry Holt highlights the importance of chemical protection, emergency showers and eyebaths to keep your workers safe. This author once heard reports of an incident resulting from chemical exposure, which illustrated how easily problems can occur. It did not take place in a chemical manufacturer, but instead in a factory which used caustic soda - sodium hydroxide - for metal treatment. As we all know sodium hydroxide is a highly corrosive substance and workers using it must avoid contact. In this case, a female worker had been moved to a new department situated away from the area in which she was used to working when she was sprayed with caustic soda. She had not been wearing the personal protective equipment (PPE) that was normally issued and was unaware of the location of the emergency shower in that area. Although her vision had been affected by the chemicals coming into contact with her eyes, she managed to find her way back to her old department. There she was able to locate the emergency shower and mitigate the effects of the caustic soda. This incident is an example of the need to consider not only the provision of PPE against the wide range of chemical hazards, but to stress the point that the responsibility of employers does not stop at PPE. The incident in question had occurred just two metres away from the emergency shower in this woman’s new department, but no one had provided induction training for a change of location. As it happened, her own speedy reaction saved both her eyesight and body from serious injury. Most countries have well established legislation covering chemical hazards; examples are the Control of Substances Hazardous to Health (COSHH) regulations in the UK and the Hazard Communication (HAZCOM) standards in the USA. These all start with the premise that employers must identify all substances which may cause harm to workers, together with the routes through which this harm may arise. Routes through which harm may arise include inhalation of gas, fume or vapour, skin contact or absorption, direct injection into the blood stream, or ingestion. If we look more closely at these, some may appear to be self evident. Taking direct injection as an example, however, this can occur through the hazardous substance entering the blood as the result of contact with an open wound. Similarly, we instinctively think that ingestion would be very unlikely. Surely no one would swallow a substance known to be toxic or harmful? What about the cases where a hazardous substance, such as sodium hypochlorite (bleach) is stored in an unlabelled bottle? Unsuspecting individuals drinking this has occurred previously. Much of the information that will help us with the identification of hazardous substances will be found either on labels or through material safety data sheets. One problem in this respect has been the different formats in which this information may be provided, but this is being addressed through the adoption, by almost all countries, of the Globally Harmonised Standard (GHS). In most EU countries this has been going on for several years, such as in the UK with the REACH regulations. The GHS was adopted in the USA in May 2012 and the necessary training is mandated for December 1, 2013. Having identified the use of harmful substances including microorganisms in addition to chemicals, the next step in the control framework is to evaluate the degree of exposure and relate this to the accepted standards. On this basis an appropriate control strategy must then be developed. The first priority in a health and safety management system is to eliminate or reduce exposure at source. It is at this juncture, however, that we should consider the issues around chemical protection and emergency equipment. The most important and effective means of protecting workers from chemical hazards is to prevent them coming into contact with the hazardous material. If we are unable to do this through protection at source, we need to consider the provision of PPE and the ways in which this should be managed. Management of PPE involves a number of key issues: • How do we select the right protection? • How do we ensure it is used effectively? • How is it maintained? • What training is needed for employees? • How do we monitor that it is being used correctly? Failure to incorporate any of these steps can have a major impact on the effectiveness of the PPE and the health and safety of the worker. So what do we need to consider when selecting protection from chemical risks? One of the main considerations is the range of protection which may be required for workers who come into contact with hazardous chemicals. As detailed below, this can include protection for the whole body, eyes and face, the respiratory system, and the hands, arms and feet. In extreme activities such as entering a vessel that has contained toxic or corrosive materials, it may be necessary for the worker to use a whole body protection suit. These conditions can attack the skin and mucous membranes, in addition to being an immediate risk to life. The whole body suit is normally of plastic material with double zipped openings at the front through which the wearer can don and doff. To ensure that no contaminant can enter at joins, boots would normally form an integral part of the suit; gloves that may be of a different material would need to have a liquid or vapour tight fit at the wrists. In addition to the need for a material that is resistant to the hazardous substance and in view of the conditions in which the suit will be worn, the material must have sufficient mechanical strength to prevent damage from not only wear and tear, but also from contact with fittings within the vessel; for example, pipes or stirrers. Working in a chemical protection suit can be extremely fatiguing and potentially dangerous, so it will require a supply of filtered air via a hose line that should be connected to both the suit itself and the helmet. Where the work is to be carried out within a confined space in which the temperature may be elevated, such as emergency work within a chemical process reactor, the air supply should incorporate an air conditioning device. Safety spectacles should only be used to protect against chemicals where the possibility of exposure is small, e.g. in laboratory bench work. A model should be selected that has both side protection and protection against the contaminant entering above the lens. It is often preferable to make use of goggles which normally provide this type of protection. Whichever is chosen, it should be ensured that they are rated as chemically resistant. It is not uncommon to find workers wearing spectacles or goggles which are only impact resistant. Where the identified risk extends to potential injury to the face as well as to the eyes, a face shield would be more appropriate. In some cases face shields can be used to supplement spectacles or goggles. Respiratory protection against hazardous chemicals can take a range of forms depending on the situation in which it is to be used and the duration of the exposure. The first category works by providing a supply of clean filtered air to the user. This can be by way of a fixed air line, supplied from a compressed air source via a hose and pressure reducing valve. Alternatively, it can be a self contained breathing apparatus (SCBA) where the air supply is provided by an air or oxygen cylinder on the user’s back. In some cases a combination can be used. When selecting and using SCBA there is a choice between closed or open circuit devices. In a closed circuit SCBA the exhaled CO2 is recycled after purification. These have a limited life of approximately one to four hours and are mainly chosen for escape situations. For longer use, the open circuit device supplies compressed air, not oxygen, from a cylinder at 2,000-4,000psi via a regulating valve. There are issues to be considered in the way of use. It is important that the device is checked before use to ensure that there is a good air supply reaching the user. In a case investigated by this author, a maintenance worker had to enter a solvent extraction unit to repair a fault. The worker was equipped with SCBA but was in a hurry and did not check the supply sufficiently. He entered the vessel, which contained hexane vapours, was overcome and was observed through a glass panel lying on his back. This raises a further issue, which is that there should always be an employee on standby who is also equipped with SCBA and with a means of recovering the employee who has been overcome; for example, with a lifeline and a winch to connect to the harness that should be worn by the person entering the vessel. The most common category is the filtering respirator, which works by removing the contaminant from the air which is breathed. In addition to the common fibre respirator that can be used for filtering large particulates such as wood dust, chemical hazards including vapours and fumes are removed by cartridge type respirators in which the contaminants are absorbed on activated charcoal, or other suitable absorbent materials. With this type, it is important that the cartridge is selected for that specific material. This author was concerned to find a worker exposed to ammonia gas using a canister designed for organic vapours only. It is also important that users of filtering respirators are aware of the need to ensure that they fit correctly and that there is no potential for leakage. Cartridges must be changed when used up. Whatever the type of respiratory protection selected, it is important that it is as comfortable as possible for the wearer. As an example, one company bought air fed helmets for workers in a sulphur grinding operation. These were equipped with a fan, motor and battery pack at the rear and were so heavy to wear that only one had been removed from its packaging. Hand, arm and foot protection provides a barrier against contact with corrosive or irritant chemicals, as well as those which can give rise to skin sensitisation. While it is often thought that any glove or boot would be sufficient protection, it is important to understand the need for different materials depending on the contaminants in question. Materials used for this kind of protection include: Gloves should be sufficiently long as to come above the wrist while not leaving a gap between the glove and other clothing, such as shirt or coat sleeves. Gauntlets that cover the whole arm and have tops which can be turned down to catch any spillage should also be considered for use, particularly for when pouring from large containers. To protect feet from acid or alkali splashes rubber boots should be worn. When wearing boots, workers should not tuck the trouser legs into the boots as this can result in contaminants running down the leg and into the shoe. Having selected an appropriate form of protection against chemical hazards, it is essential that employees are issued with it and are made aware of the correct way in which the PPE should be used and maintained. This also applies to the ways employees can abuse PPE. This author once heard of an asbestos removal site where one employee was correctly kitted out with PPE, but had drilled a hole in the respirator so that he could smoke a cigarette through it. Similarly, when storing chemical protective equipment it is essential that it is stored away from potential contamination. This author has personally seen goggles which have been stored so that hazardous material has been able to accumulate inside the lenses. There is also a need to have a programme of replacement for worn out or damaged equipment. 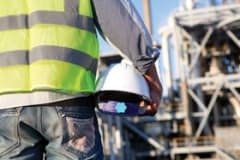 In most countries legislation requires that PPE is provided free of charge by the employer and that it should be replaced free of charge, unless it has been damaged as a result of misuse. Much research has been carried out into the reasons why employees ignore or disobey safety rules, including those related to the use of PPE. A common cause found by Lawton (1998) is that there can be confusion regarding the rules. This article has so far considered the means of protecting workers from chemical hazards, but as mentioned in the first paragraph this is sometimes not successful. If chemical contamination is seen as a significant threat it is necessary to put measures in place to mitigate the potential harm. Two key means of reducing the harm are safety showers and eyewash equipment. In each case there are certain issues which must be addressed before installation. When someone has been sprayed with corrosive material they will be in pain and possibly disorientated. Unless they are fully aware of the location of the shower or eyewash station, they may well be unable to find it in the event of an emergency. This was the situation in the opening example. Clearly in an emergency situation every second counts, so it must be ensured that every employee knows the location of their nearest emergency point and that they are clearly marked. It may seem an obvious statement, but the shower or eyewash station must be capable of being used at all times. While there will be occasions when the water supply must be turned off for maintenance, this should be subject to a lock out/tag out procedure that will ensure the supply is reinstated when work has been completed. As the injured person may be disorientated and may potentially have impaired vision, they may have difficulty in activating the controls for the shower. To reduce the risk of this, many showers now are activated by the person stepping onto the plate at the base of the unit. Showers are also available that, in addition to the spray from above for the body, incorporate lower level eyewash sprays. There are situations such as tanker loading areas which are external. The water supply to showers located there should be lagged and trace heated in cold environments. This will prevent freezing of the water when it is needed, as well as preventing the shock of ice cold water on the injured person. When considering chemical protection it is essential that all the various measures are combined into a management programme based initially on the elimination or reduction of potential exposure. This should be supplemented by measures such as have been discussed in this article, which will ensure the selection of the correct equipment. The programme should also include training for workers in risk awareness and in the use of control and mitigation measures. It should also include procedures for storing and maintaining protective equipment. Finally, any programme must be subject to periodic review as knowledge about new and existing risks may change, while improvements in technology can require changes in protection.